Universal Process Engineers is an organization, aspiring for new goals and settings new benchmarks constantly in Starch and glucose equipments. Right from the inception, the company has been persistently thriving to develop new technologies and achieving innovations in manufacturing of Starch and glucose equipments. A highly experienced and determined team expounds towards building new strategies and expanding the horizons of the engineering world. Well equipped to work hand in hand with our clients and serve all the people striving to make this world a greener and better place to live. Starch is produced from various raw materials like maize, cassava, tapioca roots, potatoes, wheat, rice etc. 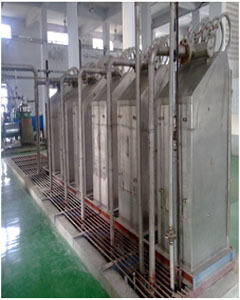 Depending on the method used to hydrolyze the starch and on the extent to which the hydrolysis reaction has been allowed to proceed, different grades of glucose syrup are produced using our starch and glucose equipment, which have different characteristics and uses. We can also help you to get the most efficient Starch and glucose equipments; we are always ready to offer after sales services of starch and glucose equipments regularly whenever required. We have a group of experienced process and mechanical engineers and technical persons having experience in starch industries.